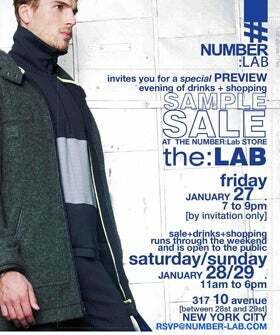 Okay, so super-chic menswear store Number: Lab is letting invite-only VIPs get first dibs on their sample sale goods this Friday, before they open it up to the public the next day. Bummer, right? Well, not for you! R29 readers are all invited to this exclusive preview, where you can snag basics, blazers, dress shirts, winter-approved outerwear and much more, for up to 70% off. Oh, and that's not all: Number: Lab is giving one of you $250 to shop the sale, meaning you'll be sure to walk away with enough goodies to wear until, well, next year. All you have to do is "like" this post on Facebook, and you're automatically entered to score the swag. We'll announce the winner tomorrow morning! Sounds like pretty good...numbers to us. When: Exclusive Preview: Friday, January 27, from 7 p.m. to 9 p.m.; Sample sale open to the public from Saturday, January 28, through Sunday, January 29, from 11 a.m. to 6 p.m.
Where: Number: Lab, 317 10th Avenue (between 28th and 29th streets); 917-523-6879.